At our meeting last Friday, we were delighted to have the opportunity to learn about using Mindfulness to help improve the way we communicate, whether personally or professionally. Barbara Reid, a teacher of Mindfulness-based Approaches, explained that Mindfulness is not a set of tools or techniques, rather an approach which help us to learn to pay attention to those things that often just pass us by, and in doing that we can change the way we perceive people and events. This in turn builds awareness and resilience and helps us to break what Barbara termed a “reactive cycle”, or “autopilot” when faced with a particular situation and instead gives us a greater range of behavioural options to deal with it more calmly and productively. 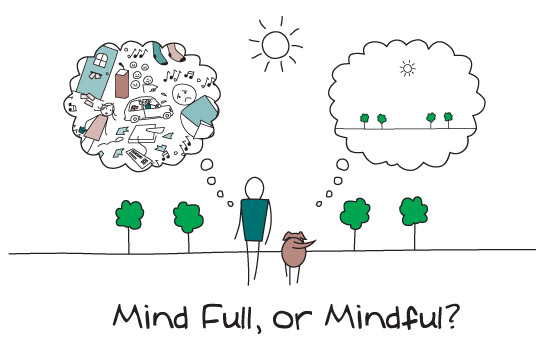 Mindfulness has its roots in ancient Buddhism, and is nowadays the focus of a great many behavioural change programmes in healthcare, education, sports coaching as well as the corporate world. There is strong scientific evidence to suggest that it is effective too: neuropsychologists have discovered that, just as exercise strengthens muscles, by simply repeatedly doing something over and over again, certain patterns of brain activity are reinforced and become stronger and our brains get more used to working in a particular way. During the session, Barbara invited us to take part in some mindfulness practices and to simply notice what happened and what we felt when we did them. It was interesting to hear the experiences that the participants shared afterwards – almost everyone felt some sort of perceptual shift and became more consciously aware of what was going on around and inside us. After a quick cup of coffee and a naughty-but-very-nice Danish pastry, we set about discussing icebreakers and what makes a good one good and a bad one bad. One of the aims of Bridge2Learning is to provide opportunities for trainers and coaches to share ideas and good practices, and it was wonderful to see this in action. Icebreakers are a fairly standard element of most training workshops, and a good ice breaker can help to set the tone for a training session and help create a positive relaxed learning environment. A bad icebreaker, on the other hand, can have the opposite effect. For me, the worst type of “icebreaker” (and yes – it’s in quotation marks for a reason!) is one where delegates are just asked to go round the table and say who they are and what they do. This lacks creativity and probably does very little to stimulate and motivate participants – it just makes people feel awkward from the off. What impression does an activity like this give about about the trainer or facilitator? The group agreed that a great icebreaker should be short, simple and it should have a purpose. It may be linked directly or indirectly to a training topic, but above all it should add some learning value to the session. The group then set about working on some “killer icebreakers” that could be used with groups. It was great to see the variety of different activities that were devised, and participate in the delivery (how many of us ever get to actually experience our own training activities?). We’ve collated all the icebreaker ideas and put them in a word document for easy downloading. Overall, the morning was full of energy and generous sharing – thank you to Barbara and to everyone who shared their ideas with the rest of us. Look forward to seeing you again soon!